Each of these aspects can be literally or metaphorically illustrated by a consciousness state, particularly if we include dreamlife. In fact, they are all present within each and every one of us when we turn our attention inward. We have observed many dream journeys to which these descriptors could apply. For example, the quality of shuffled time/space is seen in the precognitive or prophetic dream. An attractor-centered dream might focus around a specific psychological complex, which acts like a magnetic center [strange attractor] for emotional conflict. Chaotic systems are also complex, as are dreams. They represent systems that are far-from-equilibrium. Jung contended that dreams help maintain psychic balance. The scientific metaphor provided by chaos theory allows us to describe the psyche in terms congruent with physical reality as presently understood. Old psychological models have placed emphasis on order, and the overcoming of chaos. Yet chaos has a perhaps unrecognized value, in our psyche and physiology. Just as a healthy heart sometime goes into a chaotic pattern, turbulence and chaos help us break down old, outmoded structures in personality. Even the deterioration of mental illness is quite purposeful in that it is the individual's attempt at healing and finding a new emergent order. Chaos theory provides a comprehensive metaphor for uniting physical, emotional, mental, and spiritual realities. COLLECTIVE PSYCHE is a meta-theory of mankind, first suggested by Jung. Today we call it The Field or zero-point. Reality dynamics is the ocean of collective knowledge and transpersonal psychology, the invisible hand of self-organization and synergistic fractal logic in complex systems. 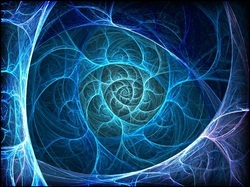 We share our essential holographic nature as fractal expressions of a field of consciousness. Our being is implicit in the source field. Consciousnss is a superposition of unconscious and conscious between the metaphysical and physical, flowing from the micro to the macro. Our decisions occur subconsciously seconds before we become aware of them. We are all connected at this field level. The unconscious is a matrix of unconscious dynamics. The collective Shadow captures us through the personal shadow and self-interest, bridging us to the collective consciousness mass psychosis. We sense we are ending and yet just beginning because both are simultaneously and timelessly true. Humanity's race is against time toward the great Unknown. The perennial question remains, "What is wrong with the world and why is it that way?" Neither religion, philosophy, nor systems theory has been able to do more than balance out the negative, much like Yin and Yang. Transcendental religions seek to escape time and its dichotomies altogether. The treasures of cultural history and spontaneous renewal reside within this living field, our connection with the primal source of life and parallel phenomena. The history of the world emerges from the multidimensional field of possibilities. Somehow life works despite infinite deviations. Viability can be anticipated if not planned. But we've outgrown Earth's carrying capacity. Though barely aware of them, we are tied together by deep processes. We can learn to consciously understand and apply, rather than destructively act out these eternal patterns. We must learn to recognize what is being revealed even though it is always open to interpretation. We are also subject to delusions and misperceptions, so we need to learn discernment. In the archetypal realm, the beginning and end of days is always with us in each and every moment as the mythic dimension. Myth describes breakthroughs of the sacred into the profane or historical time. Precession, marking the great cycles of life, means the sacred is intersecting the mundane as 'eternal return.' All things become truly 'real' by imitating this model of the celestial archetype. In cyclic time, what has occured will repeat. Actions are 'virtuous' if they conform to the sacred pattern which gives the world form and meaning. Eliade suggests that the abandonment of mythical thought and the full acceptance of linear, historical time, with its "terror," is one of the reasons for anxiety today. But the fact is everything begins over and over again in each and every instant. This process of quantum refreshing means we are created anew in each moment, like pixels on a screen. Clearly, with the Precession, we have an unprecedented opportunity to move into the metahistorical mythic flow of sacred time and perhaps help renew the world and universal history. Even without choosing it, it is being imposed on us at this time. By flowing with it, reintegrating cyclic time, we reintegrate ourselves. Rather than a literal pole shift of the Earth, it is an opportunity for a pole shift in the collective psyche. Is the Universe calling to us through eschatological visions, such as 2012 galactic alignment, future studies, singularity, transhumanism, UFO/ET mythos, Ascension, ZPG, postmillennialism and religious visions? Nothing is preventing us from having our own "rapture" right here, right now, since it is an achievable perceptual state. Negentropic potential can emerge at any instant in complex systems. Paradigm shift is a new way of looking at the mystery and meaning of life. Whether these competing scripts and speculations play out or not, they provide us with mythic rallying points. Seems like everybody is having that dream. But, do we have to imagine our end to find a new beginning, to reinvent civilization? Change starts with the questions we ask because they have the potential to shift our awareness. What is inconceivable one day may not be the next. The tipping point could come at any juncture. Aeons are marked by the Precession of the Equinoxes -- the Great Return -- which formed the root and core of mythical thought long before written history began. All major civilizations have their versions of Precession - the mythology of the Milky Way - with myths of golden, dark and perished ages. To face our own mortality is to face what it means to be most fundamentally human. Is it the beginning of the end or the end of the beginning? The serpent of the eternal bites its own tail. Precession defines our relationship to the galaxy and is the root of our notions about the beginning and end of time. Thus, mythology is linked to cosmology and our galactic destiny. In this sense, we long to escape the confinement of our historical times. But history is cyclic, renewed in a new order, a new creation. The mother of all myths, Precession is a cataclysmic force, the basis for myths of disorder and the end of ages. Both religious and secular models speak of violent disruption which challenges us to find new ways of cooperating and being. We have even deduced the ultimate fate of the universe, yet our own remains in question. Will the human race breakdown or breakthrough or some combination of that? Just as order arises from chaos, we can deeply synchronize with one another to good effect, healing ourselves and perhaps our planet. We are ripples on an ocean of collective psychology which has laws of its own, as Jung demonstrated. Archetypes are attractors that organize otherwise weak interactions. Jung called archetypes the great decisive forces in events. There are archetypal dimensions to world events, including wars, politics and mass psychology. Just because events are collective, they do not need to devolve to the lowest common denominator of consciousness. Collective events make this transpersonal voice known to us when enacted in the world. Integrating this force is transforming. Each of us is an integral part of the untapped potential of all creation. We are bound together by the collective power of imagination. Resonance with this field provides a guiding coherence -- a guide wave -- opening us to reenchantment of world and cosmos beyond postmodern fragmentation. Collective psyche is the ultimate source of creative solutions and inspiration for global transformation. Intelligence resides not only in, but among us all. The mythic dimension reveals itself to and through us all, making the global drama a gripping enigma. We do not achieve excellence through violence and destruction. Wars on terror, drugs, cancer, and poverty have led nowhere. We can create together through nonlocal, nonconventional means, increasing capacity with a sense of connection and trust. There are interpersonal, organizational and sociopolitical benefits in amplifying these field phenomena through creative collaboration for the common good. The new cultural guide is not the manic overachieving violent hero, but the artificer or synthesizer who can "make do" and actively make things work with what is at hand in the here and now. The maker and shaper is the transdisciplinary role model of basic human urges of transformation, ingenuity and original design. A knowledge of principles leads directly to a process of creation and problem-solving. Collective psyche is a correlated readiness to respond, living aligned with creation, literally from the ground (of our being) in the day to day world. Creativity emerges from the multidimensional constraints of each moment. Source of archetypes, myth and dreams, objective psyche is also the source of wisdom, genius, inspiration and adaptive value relevant in every era including our own. The very architecture of the collective psyche is evolving, pregnant with new vision. It funds our collective explorations of our sustainable futures with new ideas and inventions. The source of what matters, energy/matter is not different from psyche. Psyche is the dynamic totality of all conscious and unconscious psychic processes. If consciousness is the root of matter, as some physics models suggest, it includes everything we imagine, experience and know as well as what we cannot know, including viable futures. Real awareness is being present in the moment. The confluence of future and past is eternally present now, pregnant with potential. Collective psyche "remembers" the future before it arrives, runs all superimposed scenarios in the multiverse before collapsing into ordinary reality. Collective psyche can provide prescient glimpses into possible futures. Can we, therefore, change undesireable timelines and outcomes using collective psyche as applied human survival technology? Perhaps we can, through recognizing, forming and making new patterns manifest. Both individual and collective psyche possess layers that lie below consciousness. We can examine the beliefs and behavior of our global society, in general, just as we can analyze and foster emergent creativity in individuals with therapeutic effect. The collective shadow of the old paradigm still plagues us. The collective psyche itself demands resolution or at least fascinates us with its elusive nature. To find peace in the world, we must find it within. Images arising in the collective psyche are internalized as dreams and visions. We sense autonomous forces beyond us at work. Deity resides in the collective psyche. Even in physics and life sciences, psyche and matter are no longer split. Collective intelligence and identity are externalized online in social networking and digital alchemy. This superset is a new human identity, embodying that tangibly greater than self. We are practicing higher order collective cooperation, collectively reinventing ourselves as a species. Collective conversation moves at the speed of light. Healing happens at the creative edge of chaos, by pushing up against our own boundaries. It happens by letting go of old outmoded patterns and making way for new self-organizing dynamics to emerge. Just as one powerful experience can create trauma, a single potent episode can mobilize healing - a quantum leap to recovery of body, soul and spirit. 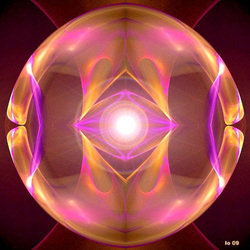 This holistic philosophy of treatment is an new emergent healing paradigm - holographic healing. All of Nature and our own nature arises from the omnipresent centerpoint of Zero-Point Energy or vacuum fluctuation, beyond energy/matter. There is an infinite realm of pure potential beyond the threshold of the Mystic Veil of manifestation. It is the primal Source of all light and life, love and wisdom, passion and creativity. The strength of our connection to Source determines our relative health and well being, our freedom to be and express our essential nature, and to manifest our own potential. Our whole body flickers in and out of existence at the quantum level at an astounding rate, and each of those quantum re-creations is an opportunity to transform utterly. First we have to let go of the old outmoded self like a snake sheds a skin that is too constricting. Re-creation emerges spontaneously in a new form as transformation and healing. At our core, we are artful and heartful, able to tap our potential for nourishing wisdom, love, bounty, health, peace and other desirable qualities and outcomes. Emergent healing is the result of self-organizing criticality, inevitability of global change, restored organismic integrity. 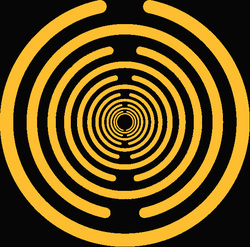 Our own personal Zero-Point is our core self which connects us directly with our hyperspace Source. When we stray too far from our own core beliefs, self-image and self-expression, we feel like we aren't ourselves. Once we reconnect with that core we feel that all is in alignment, including our physical, emotional, mental and spiritual domains. We feel like ourselves, in our own rhythm, and aligned with Cosmos. This opens us to the synergetics effects of the flow state and synchronicity; doing better than we know. This is the authentic life, also known as self-actualization. Potential becomes lived Reality. In the process of self-investigation, it is necessary to figure out the M.O. or motivating factors that lead to behaviors. These are our basic life patterns. We all make decisions based on our internal map of reality and unconscious hierarchy of values. Values and beliefs drive our behavior.If we make our own values and beliefs conscious and focus on them, we can direct our energy toward what we really want in life. Question WHY certain values are important to you, what situations you want and what you want to avoid at any cost. Have a friend prompt you with the comparisons to make it easier. List and re-list them as you adjust their relative importance. Don't analyze it and don't overthink it or add any other strategy in this exercise. What you FOCUS ON is THE secret of life. You can EXPAND your internal map of reality. The most important variable is how you spend your time and EVALUATE what you've done. You can feel bad or guilty if you act on others' values, not your own. Values tell you the deeper structure of how you create your life. Ask yourself WHY each value is crucial and what you fear without it. If a caring partner is important, have you had uncaring partners? If you crave financial security what would it mean to be poor? Would you rather be happy and poor or rich and unhappy? What do you want to avoid? What are you with or without it?How do you rank the values of happiness, guidance, learning, career, money, reknown, success, good relationships, mentoring, balance, integrity, passion, creativity, spontaneity, self-expression, novelty, excitement, comfort, service, compassion, IF those are some of your values? Is balance or success more important than family or communication? Is peace of mind more important than a partner? than personal growth? Can you have money and integrity at the same time; money and family; money and happiness; freedom and relationship simultaneously? Health, avoiding failure, or avoiding pain? Art is a flow state. We cover taxonomies or maps of consciousness, creative typology, healing, ontological and epistemological notions of creativity--from first causes to root metaphors--cosmic creativity and personal creativity, including how we know what we know and how to use that to heal with metaphor therapy. Healing is a form of creativity. Consciousness is a dynamic field that has the dual aspect of primordial process and appearance. Process is conscious dynamic energy. Process and perception lead to an understanding of appearance. Our consciousness oscillates at the fundamental level between the inherent drive for change and our attempt to maintain identity and stability. We are creative beings and that creativity is an emergent process from cradle to grave. We offer a self-test for self-actualization and some suggested milestones for the developmental process that continues throughout adult life. We provide a context for nurturing creativity and honor the multitude of creative experiences, forms and media. Span the realms of Trance, Art, and Creativity into the genius of expression of human potential. First we get hints of emerging talents which are later stabilized into a creative steady-state through integration. Genius can be awakened in everyone. Higher art must be intensely personal while being universal and universally accessible. It must show refined knowledge, understanding and respect for the art that has come before to enrich those around us. Much the same can be said for an artfully and heartfully lived life. We can apply a similar strategy to our spirituality, drawing on the best of what the past offers while keeping our practice and service contemporary and relevant. Our lives become multidimensional artful expressions without frames, embodied in living Light. Process-oriented spirituality is eclectic and intensely personal. Jung introduced the notion that archetypes -- what were called ancient gods and goddesses -- are dynamic patterns that eternally operate in our lives and our world. They are the primal driving forces of man and nature, metaphysical strange attractors whose influence pervades the whole spectrum of domains from cosmic to subatomic. Theirs is the fabric that weaves Above and Below together, seamlessly, as a holographic whole. Our worldviews, basic assumptions about the way the world is, are undergird with mythic patterns which condition our beliefs, thoughts, feelings and actions. Personal mythology is a vibrant infrastructure that informs your life, consciously or unconsciously. Living mythically means becoming aware of your personal and collective origins. These forms structure our awareness; in them we find the root cause of our difficulties and our healing. Solutions to intrapersonal conflict is a first step toward solving global conflict. The opening quest of this work was for a new way of heuristically experiencing, and thus more wholly understanding, the essential meanings and fundamental functions of the phenomenon resilience. Application of the CRP process allows us to enter these conceptual worlds for a first-hand experiential journey through these states. We've theorized that perhaps resilience is really about the successful communication of information back and forth between all of life's existential states. The answers to this research question have ubiquitously appeared in our long journey through this work. They will continue to emerge in relation to the CRP or dreamhealing process throughout the commentaries which constitute the rest of this journal Chaosophy 2002. The current model of resilience is shown to be psychologically rooted in metaphors depicting competition of available energy resources. With "rebounding" and "elasticity" being described as its predominant characteristics, the image created is that of one force being resiliently stronger than its opposing force. This is a mythology whose potential usefulness seems to have expanded over the course of our competitively-waged human history. We proposed that the application of a more harmoniously integrative psychological model of the life process might thus help facilitate a new kind of resilience within the world community; one which would simultaneously enhance, --one increasingly consciously resilient individual at a time, --the conscious evolution of the whole. Humanity's fundamental pathology was envisioned as a potentially terminal imbalance of its logos (rationality) and Eros (feeling) functions which are in need of the holistic healing that a new, more constructive way of experiencing its polarities could provide. The goddess Harmonia is the archetypal image whose inspirations synchronistically appeared to guide this heuristic search for whatever truths we were ready to receive. The archetypal healer Asklepios will inform our further applications of these discoveries in non-interpretive, experiential healing journeys in waking REM. Thus we are armed with the firm conviction that resilience is about the ability of each of life's being states to become more whole through mutually meaningful interactional dialogue and commerce between all of its other being states. We set out to logically define the functional boundaries of the resilience process and creatively describe its many emergent manifestions into that functional form. The underlying question was: "What is the essential nature and fundamental function of human resilience?" A spiritual endeavor. We need to learn the art of living well, instead of living better. This means alignment of our physical, emotional, mental and spiritual lives. We can root out the disturbances of the past and transform them into assets, or strengths. We can remove the incongruencies of conflicting agendas in our belief systems and their fallout - our feelings. When we change our attitudes about ourselves and our past, we initiate a cascade of neurological changes that cover all four domains of our being. We can cultivate deeper awareness. The mind can change what "matters". ANCIENT/FUTURE METASYN: We can take responsibility for our bodies and health, reclaiming our inherent shamanic, yogic and psychosomatic self-healing power. This alone changes our compassionate spiritual relationship to self, others, and universe. The old-yet-new healing paradigm includes non-material but highly-effective shamanic, psychic and spiritual tech that can be applied effectively in any cultural context. Mind is more than a powerless prisoner of the body. It has the power of focus, committed attention and intentionality. Take responsibility for you own healing and well-being, of your own life, the self-organizing power of your own hyperdimensional organism. CHANGE N A HEARTBEAT: The average heart beats 2 billion times and you can change utterly in any one of them. Reclaim your innate capacity for changing the cellular, subatomic, and psychophysical processes of your energy body. WHAT you THINK and the excitation level of your overall system changes your chemistry, markedly. We are fluid fields, through which energy and matter dynamically flow and change. Lifestyle, diet, emotional state and consciousness play a huge role in health and disease. We can catalyze our psychophysical homeostasis and spontaneous healing processes, complementing any traditional care we may require. SELF-IMPROVEMENT: Who says Life is Fair? If there is no Justice, maybe, there is JUST US. Directed self-motivation is one of the greatest gifts you can give to yourself and it can be learned. YOU HAVE THE POWER - the power to focus your attention where it will do the most good, the power to create instantaneous change in your moods, attitudes, and feelings. Through subtle, disciplined techniques you can do it by connecting with the creative Source. CONSCIOUS ALCHEMY means changing the psychological Lead of your unrefined personality into the Gold of creative self-fulfillment. Every day is a Vision Quest. Is pain, grief, depression, fear, anxiety, guilt, relationship or career disappointment, rejection, alienation, inner conflict, victimization, resentment, superstition, rage, self-doubt or procrastination holding you back, Perhaps your old view of your self has become confining, obsolete, role-bound, or you just feel stuck. Are you afraid you can't cope with either failure or success? We always have to adapt to our environment. You have to TRY, even to fail. Maybe you think your 'glory days' are all in the past. Through CONSCIOUS ALCHEMY you can retrieve the psychophysical biochemistry of your balanced and peak performance states. You can apply this to pain management as well as emotional issues or boosting your potential. By recalling vital times, you essentially regress your body chemistry to a more youthful you, and minimize the toxic chemistry of stress. This allows both body and mind to relax and recalibrate homeostasis. You can also draw on the support and encouragement of your evolving future self through imagination. Just as one incident can create trauma, one healing moment can change that instantly. AUTOSUGGESTION: Even small changes in your thinking and attitude can change the way you think and feel about yourself, and your potential for self-expression, challenge, and resilience. It can help you feel you can regain a measure of control over your body and mind. The more positive energy in your life, the less room there is for self-defeating negativity. The more you move toward your positive future, the less the past can exert its backward pull. All you need is the resolve to meet the fear and pain that block you from creative change. Perhaps you've just lacked the right tools to help you realize your potential, to make it so. Self-mastery is a continuous process which can be used to improve your position wherever you currently find yourself. Our motivations come from our beliefs and values. But along the road of life we may not have developed the resources to deploy our skills or have fallen into traps that derail us when we try. Identifying beliefs and roadblocks is a solid first step to change. You already probably know exactly what you would like to change, and just how you feel when that's not happening, and even where you feel that in your body and what it is like. 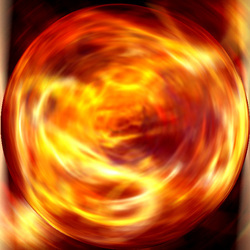 The body is an alchemical furnace. The brain sends chemical messengers - neurotransmitters of pain and pleasure - throughout the body. In turn, the body sends signals to the brain about its sense of distress or safety and well-being. We can intervene intentionally in this cycle at any point. We can use nutrition, exercise, and psychosensory exercises that create the kinds of experiences that move us forward in our goals. This is 21st Century alchemy - intentionally changing body chemistry from both inside and outside. Our organism obeys one of the maxims of information technology: "Garbage In; Garbage Out". What happens when stressed-out vets return from the war theatre and try to resume their lives with business-as-usual? Many, if not most, find that to be impossible, because they are not the same as they were prior to deployment. In fact, many contend with sleepless nights, inability to focus, depression and Post Traumatic Stress Syndrome. SUICIDE EPIDEMIC: Studies show at least 35% of the Iraq War vets have PTSD, many to the point of being suicidal. Suicide is at a record high: 20.2 per 100,000 soldiers. As there is an average of 10 failed suicide attempts for each actual loss of life, the figures suggest that more than 1,600 serving army and marine personnel tried to kill themselves last year. An estimated 30 percent of soldiers who took their own lives in 2008 did so while on deployment. Another 35 percent committed suicide after returning from a tour of duty. Two-thirds screened positive for PTSD are not receiving treatment. Those who do are often just medicated without talk therapy. Even so, many still experience attacks seemingly out of nowhere, mimicing their Iraq experiences. Twenty percent of female soldiers report "military sexual trauma." The boundaries between friend and foe collapse. When PTSD was first discovered in combat veterans in WWI, it was known as SHELLSHOCK, and studies of these vets by Britain's Tavistock Institute led to new discoveries about the breaking points of personalities and how lives could be shattered by the faultlines of unseen wounds lacerating the soft connective tissues of the personality and self-image. Transcendence is an emergent quality that can become stabilized in mature spirituality as self-actualization. Self-transcendence has been hypothesized as a critical component of wisdom (Curnow, 1999) and adaptation in later life (Tornstam, 1994). It reflects a decreasing reliance on externals for definition of the self, increasing interiority and spirituality, and a greater sense of connectedness with past and future generations. The relationships between self-transcendence and neuroticism, openness to experience, extraversion, and agreeableness are significant. Self-transcendence cannot be accounted for in terms of positive personality traits alone. Self-transcendence is negatively related to neuroticism and positively related to meditation practice. Where are the boundaries of conscious experience and self, and why do these boundaries exist? What is beyond this mystic veil? How do boundaries, roles and pathology develop in interaction with parents, caregivers and others? In what ways are they conditioned by prevailing systems of belief, philosophy, sociocultural history, and environment? Blind control of social and cultural beliefs is tyrannical and has led to polarization and global culture clash. How is adult experience and sense of self altered by physical, psychological, social or spiritual development? How does subjective experience relate to intersubjectivity? How do changes in conscious experience affect one's sense of self, for example through meditation, mysticism, or in pathological states? Wonder, novelty, surprise, awe, and transcendence are boundary breaking allowing us to move beyond ignorance, fear and prejudice. As Einstein said in a famous exchange with Werner Heisenberg, Its the theory that determines what we can observe. In this book he proposes that the opposition of culture to survival is absolute: Our culture is what is to be transcended. Pearce shows that in nature versus nurture our biological potential has lost out to a culture that not only does not nurture us, it actually threatens to destroy us as a species. The conflict we now face is our culture against our biology. Biology and culture influence each other, usually to the detriment of the former. He warns that culture absorbs and transforms any content into its own formative structure. (p. 119) In short, it co-opts everything to its own self-serving, preprogrammed ends: Culture is based on fear and loves its own. (p. 160) Also, culture protects and preserves itself against the transcendent functions inherent to our biology by its reliance on the older and earlier systems of cerebral adaptation that we have outgrown. Pearce introduces the emergent science of neurocardiology, the new medical field exploring the brain in the heart. He cites specialists in this field who have determined that half or more of the cells of the heart are neural cells like those making up our brain. Some reports claim that 60 to 65 percent of heart cells are neurons, all of which cluster in ganglia, small neural groupings connected through the same type of axon-dendrites forming the neural fields of our brain. (p. 64). Deep breathing, calm heartbeat, vagus nerve regulation, creative visualization and meditation are all forms of regulating the state of the body, of recalibrating it. We can reclaim our biology and some moments of quiet sanity through self-regulation and meditative technology, with or without any attached spiritual doctrine. It is easy to meditate effectively, even as a beginner, by using brain synchronization CDs which automatically drive the brain into large synchronous discharges of alpha and theta waves. You don't have to worry if you are doing it right, or can do it, or just forgot to do it - it is simply Being There. If we care for our bodies and minds, they care for us in return. Meditation helps us recalibrate our entire system by taking a time out from the daily grind to refresh ourselves with the blessings of Source, our sacred treasure. Poetry, prayer and meditation open new realms of genuine giving and receiving. This creative power feeds, sustains and revitalizes our special qualities of spirituality; Love, Communion, Vision, Freedom, Expression, Humility, Integrity, Honour and Peace. 1. The first step is relaxation or surrendering of the body and mind so that the mind is uncluttered by unrelated and disturbing thoughts. If thoughts come let them float away like clouds without attaching to them. Let go of disturbances and psychophysical stress. Notice the vibrancy of silence. 2. The second is concentration on a limited area of mental focus to control and direct the mind towards the chosen "object" of concentration. You can focus on a figure, an object, the concept of love or the energy in your heart center, mindfulness, compassion, emptiness or whatever you like. Hold your mind to thatpoint of focus, bringing it back if it wanders to various other unrelated thoughts like daily life, needs, desires, the future and the past. Empty your mind and pass through the Mystic Veil. 3. The third stage transcends all symbols. There is eventual transcendence of the mind, thoughts and all identification with the body and personality. We pass through the Mystic Veil, entering into a state of super-mental union with infinite Oneness. Relax into that receptive mode of being. This is our source of energy, security, self-worth, freedom, strength and peace that helps us cope and deal with our daily lives. We have so much to gain by dedicating at least 20 minutes a day. We obtain greater clarity, health, harmony, happiness, intuition, understanding, creativity and problem solving ability. These three aspects, RELAXATION, CONCENTRATION and TRANSCENDENCE are the basis of most meditation techniques. Why call any human experience 'transcendent'? Can we develop an evolutionary perspective to explain transpersonal experiences? Our usual (99+++% of the time) experience is of being an embodied, clearly bounded, biological organism, a physical person, sensing the physical world around us via the classical, known senses. People will usually call an experience transcendent or transpersonal when they feel identified with or deeply in touch with some "thing" or process clearly beyond (trans) their personal, biological self and physical world, particularly if the experience seems beyond comprehension by the understandings (scientific theories) we currently have of how the physical world works. Transcendent Experiences (TASTE) www.issc-taste.org website. As to an evolutionary perspective on transcendent and transpersonal phenomena, I see two major lines of investigation possible, given our knowledge at this time. (4) the content of almost all transcendent experiences, such as being out-of-body, contact with higher intelligences, new kinds of knowledge, universal love and purpose in the universe, etc., is inherently delusional. Within this line of inquiry, conventional evolutionary theory tries to explain transcendent/transpersonal experiences as either pathology that will disappear as we continue to evolve, or perhaps as having some social utility, such as envisioned in a memetic approach like that mentioned by Sebastian. While I have no doubt that some useful understanding can be gleaned from this line of approach, as an empiricist I don't like the way too much of the central data of transcendent/transpersonal experiences is basically ignored rather than explained. If one stays closer to the data, people's actual reports of their transcendent experiences, the concept of evolution is quite common in them, but it is a wider view of evolution than the conventional one, for it sees the evolution of consciousness per se as the most important aspect of evolution, with physical evolution being just part of the total picture. To give just one example of evolutionary thinking in the data of transcendent experiences, in near-death experiences (NDEs) it is common for the person to undergo a comprehensive and thorough review of their life and come to the conclusion that there were important lessons in life that they had not yet learned - how to love being a common one - and so they could not go on into the transcendent bliss that complete death appeared to be from "inside" the NDE, but had to come back to physical life, usually a very painful prospect, in order to continue their personal evolution and learning. As in my previous post on the current status of transpersonal psychology, I remind readers that this field of scholarship is very young and very small, so we have only the crudest theories at present. It would not be reasonable to compare it to the detailed sophistication of physical evolution theories which have been developed and polished for more than a century. I am giving a poster presentation at the Tucson VII conference next week about the data that I believe calls for an empirical dualism approach in order to develop a comprehensive understanding of consciousness, rather than an exclusively monistic materialist one. A preprint of that poster is available under Articles Online, second article down, in the listing at www.paradigm-sys.com/cttart/ . Sebastian for raising this important issue and hope it will inspire others to think about these issues. Jung's Transcendent Function and Conscious Alchemy In Jungian Psychology, this symbol-forming power of the psyche is called the transcendent function. Before the transforming power of the higher Self is perceived in imagination (personified through one's Angel, Guide, or Guru), it is known as a symbol-forming function. Its purpose is to mediate between that which is unknown and that which is manifest. It performs its function by creat­ing unifying symbols from pairs of opposites. In this manner, it gradually unites the fragments of psychic life. It creates a series of symbols which transfer consciousness to a higher perspective or awareness by reconciling opposites. By synthesizing pairs of opposites into a symbol, the transcendent mode creates a method of transition from one set of attitudes to the next. An individual ego may work more effectively with subconscious processes by consciously attach­ing value to these symbols presented by the transcendent function. Our task is to discover these transpersonal meanings, whether they are presented to us through dreams, at­titudes, or behavior patterns. If the meaning were consciously understood, it would not be presented as a symbol. Therefore, once its meaning is realized over a period of time, another symbol appears to take its place, reflecting the new situation. 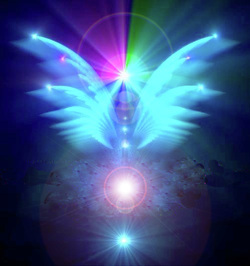 The transcendent function (seen as one's Inner Guide, Angel, or Guru), embodies the transmuting power of the symbol. The personification of the higher Self allows us to take up a relationship with the inner Self, and encourages dialogue and the development of feelings of loving devotion for this inner friend. All the symbols and archetypal figures in which the transformative process is embodied are vehicles of the tran­scendent function. It is the union of different pairs of psychological opposites (like male/female, good/evil, Sol/Luna) in a synthesis which transcends them both. The uniting symbol only appears when the inner psychic life is experienced as just as valid, effective, and psychologically "real" as the world of daily life. Fantasy animates both our inner and outer "realities." This is why mystics call time, space, and the ego three great illusions. The transcendent function, or Inner Guide, restores the balance between the ego and the unconscious. It belongs to neither, yet possesses access to each. It forms a bridge for the soul to ascend, by lying in-between and participating in both inner and outer life. By relating to each independently, it unites ego and the unconscious. The first glimmerings of "Knowledge and Conversation" with one's Angel are very similar to the descriptions of "peak experience" developed by Abraham Maslow. A peak experience is the result of the drive of the spirit in search of itself. The experience is self-validating, self-justified and has intrinsic value of a unique nature for each individual. There is an intense experience of the nearness of God, or divinity. This is the first state of grace, or mind-expansion. It is a response experience where one feels a sense of Pres­ence. The true mystic takes this experience as his point-of-departure, and grows in grace from it. The poet or artist uses this recurrent experience as a basis for artistic production (or inspiration) and personal euphoria. When the contact is stabilized, the Guide can take the Soul up to the heights of mystic rapture. A by-product of this contact is that the adept may consult at will with his guide for directions in any matter. This contact is known in Eastern systems as "getting the radiant form of the Master." It occurs only after one penetrates the lower Astral Plane through meditation. Images of the Self appear spontaneously throughout the entire transformative process. It appears in all symbols from the highest to the lowest. At the beginning of the great work it appears in animal forms such as snakes, birds, fish, horses, or beetles. It shows through the plant forms of flowers and tree symbolism. The symbols of the Self in human forms may be contaminated with other archetypes, since pure forms are rarely seen outside of mystical meditation. For example, if one's image of the Self were contaminated with the anima/animus, the vision would be of a vibrant solar woman whose aura radiates like the sun. Contaminated by the shadow, one might experience a magical creature like Faust's Mephistopheles. When one is able to perceive the radiant form, one sees the archetype of the Self in its pure form, uncontaminated by the personal complexes which denigrate its refulgence. You may be asking by now where alchemy comes into this pro­cess, and what the value of harking back to a seemingly medieval system of psychology may be. Alchemy, as a transcenden­tal search or quest, sought the redemption of the soul of matter, and its subsequent reunification with spirit. Alchemy sought to redeem the corruptness of the physical body by finding divinity within it. Alchemists projected their own individual process of psychic transformation into a pseudo-chemical process in their retort vessel. Alchemy actually sought to establish harmony between the vol­untary action of man with the involuntary action of nature. In other words, alchemists sought unification of conscious and subconscious processes, through a spiritual redemption of the physical body. This is especially true of Christian alchemists, since the body was considered inherently evil. One solution is to visualize the physical as a metaphor for psychic transformation. The imagery of alchemy is valuable since it concretizes and characterizes any personal experience of the unconscious. In other words, any process of psychic transformation, whether through psychotherapy or natural transformation, may be described through the metaphors of alchemical process which relate to specific stages of development. The operations of alchemy describe induction into conscious­ness from the original undifferentiated state, termed the prima materia. Rigid aspects of the ego or personality are broken down and remolded in the image of the Philosopher's Stone through such operations as calcinatio, solutio, sublimatio, coagulatio, circulatio, and coniunctio. The num­ber and order of these operations may vary, but the gist of the process is consistent among people. There is a generic process in nature and consciousness which dissolves and regenerates all forms. The essence of this transformative, morphological process is chaotic--purposeful yet inherently unpredictable holistic repatterning. The Great Work of the art of alchemy is the creation of the Philosopher's Stone, a symbol of wholeness and integration. The liquid form of the Stone, called the Universal Solvent, dissolves all old forms like a rushing stream, and is the self-organizing matrix for the rebirth of new forms. It is thus a metaphor or model for the dynamic process of transformation, ego death and re-creation. (c) 2010-2013, Iona Miller, all rights reserved on all graphic and written content. If you mirror my works, pls include the credit and URL LINK for reference.